I’ve done some casual coaching over the years, helping runners with goals from faster 5K times to marathon plans. Running clinics to help athletes improve running form and speed have been another way to share some knowledge and experience I’ve compiled over the years. I draw on my personal experiences, the Road Runner’s Club of America Coaching class and several running books I refer to frequently. I have started coaching on a professional level recently mainly because I know having a coach helped me through my running career and I’d like to share that knowledge with others. Thirty five years of living the “Trial of miles, miles of trials” has positioned me well to help you! My first race was at Disney World in 1979. My father had recently started running, there was a 5K that weekend and not wanting me to feel left out, he asked me if I wanted to run it. To his surprise, I enthusiastically said “YES!” We ran together and won 3rd place in the Father-Son division, running 27: 35. After that, we regularly ran local events around St. Petersburg, Florida. Dad and I attended over 200 races together by the time I hit high school and it was a natural progression for me to join the Cross Country team. While running at Boca Ciega High School, I trained with Steve Wilcox who introduced me to Joe Burgasser. Those two, along with my dad, contributed more to my running success than anyone else. Joe is still an adviser and friend today and Steve is still a good friend and we travel to a few races a year together. 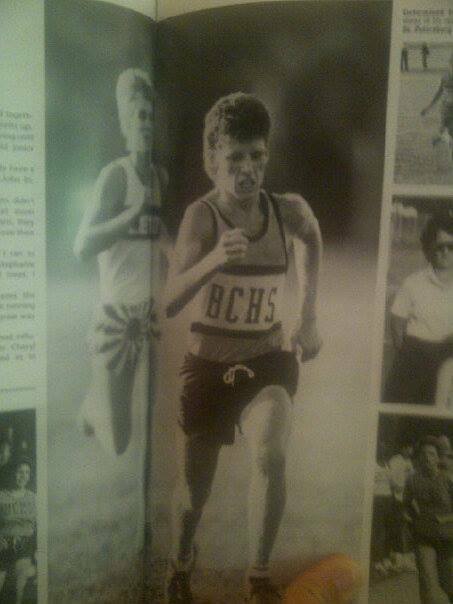 Running for Boca Ciega High School, 1989. While at Boca Ciega High School, I also played soccer and even tried out for the tennis team one year but I realized that my greatest skill was not in kicking or hitting balls around. Running was my primary ability. I placed 3rd in the State 3A meet in Cross Country and set some good times on the roads, still running races on the weekends with my dad. At a weekend road race, I met Jeff Pigg, who was a graduate assistant coach for the University of Florida Cross Country team. Jeff was impressed with my 5K race and put us in touch with the head coach at UF. 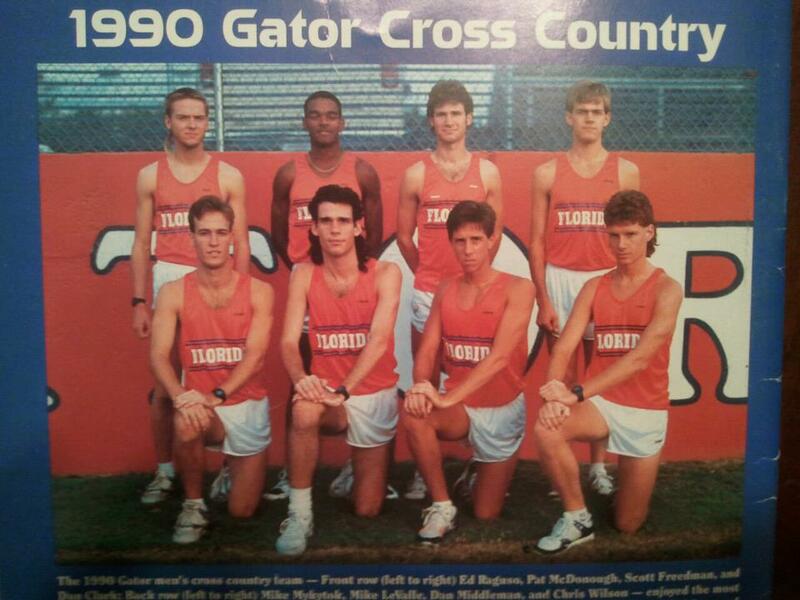 After a visit to UF where I attended an indoor track meet, I committed to running for the Gators. The team my freshman year. NCAA Division I athletics is a huge jump from high school competition. Coach Joe had prepared me well with 70+ mile weeks and tough track sessions. Still, I went from being 3rd in the state in high school to being 7th on the team in college. I earned Academic All- SEC honors and got to compete at some of the most prestigious meets in the country including the Penn Relays. I learned many lessons the hard way because I didn’t always listen to the coach. Most of the really valuable lessons came from training with runners who were much faster than me. I was forced to improve my running form, learn better racing strategy and learned how to turn in consistently fast performances. After graduating from college, training continued and I returned to the roads. PowerBar, a new company at the time, hired me as a Field Promotions Representative. I worked running expos at the PowerBar table handing out samples of their two delicious flavors. I also got to run the races; travel and hotel paid for! 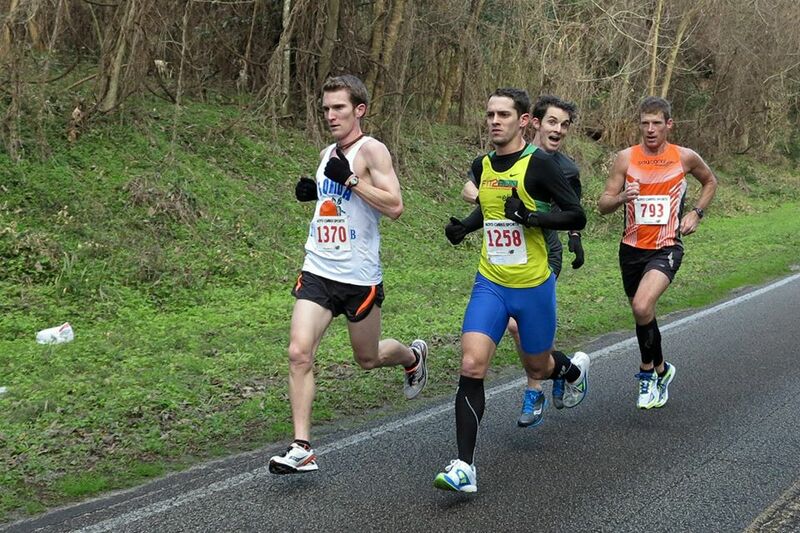 Local, Gainesville races were a part of my schedule too as I enjoyed many of the classics like the Newnan’s Lake 15K, the Tom Walker Half Marathon, the Melon Run and the Great Gainesville Road Race. Fast forward to 2009, 30 years after my first race and when PowerBar has dozens of flavors, multiple product lines and is owned by Nestle. My running had shrunk at about the same rate PowerBar grew. I was 25 lbs over weight and logging only about 20% of my former running volume. 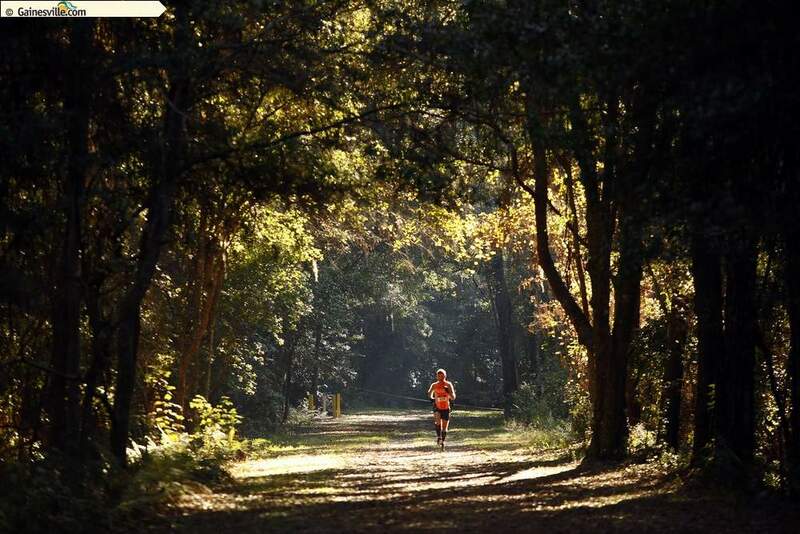 Like many runners, work, family and just a busy lifestyle had gradually pulled me away from training. New Year’s Day, 2010 was when that changed. I made a Resolution to start running competitively again. 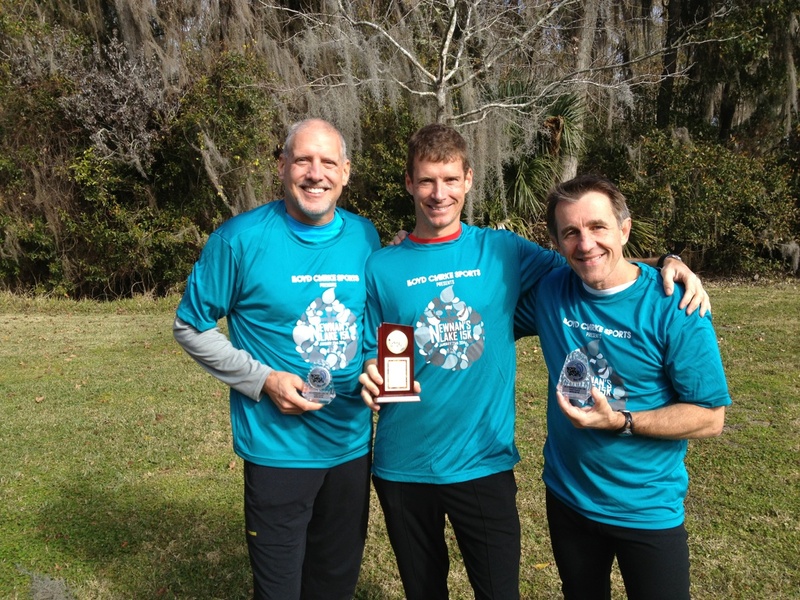 Three weeks later, I ran the Newnan’s Lake 15K, puked at the turn around point and finished in 1:01:58. The following year, I ran the race in 55:04. My 2013 time was 52:42 and my 2014 time was 51:53. My running plans today look a lot like the old days. My mileage is up, I’m on the track weekly for a workout, I run many local races and plenty of big events in other cities. 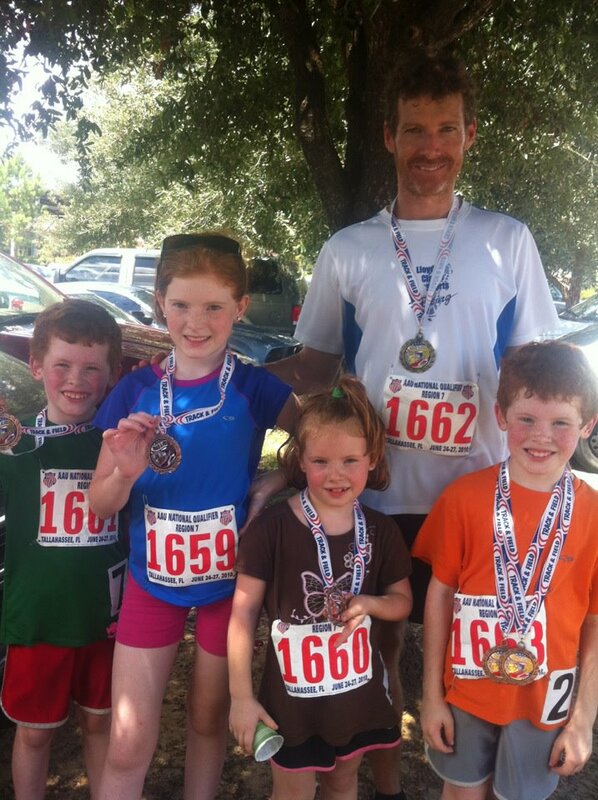 The only difference is that my kids are with me for many local races and training runs. The last 2-4 miles of weekend runs frequently include kids running or biking with me and stopping to pet horses at the pasture down the street. If you need training advice, insights on races or just want to hear crazy stories about getting chased by a billy goat during a cross country meet, join me for a run. With the kids after a track meet. Great to see that you are coaching and enjoying running after all these years. If i could still run i would have you as my coach for sure. Seeing that high school picture brought back some memories.